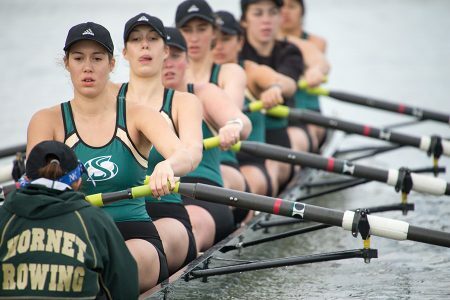 The Sacramento State rowing novice-eight team competes in first race of the season at the Sacramento State Invitational at Lake Natoma on Sat., March 10, 2018. 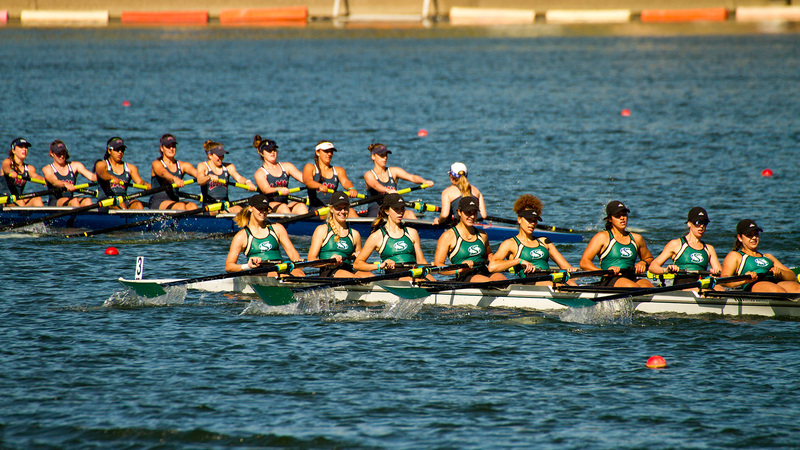 They took first place against the six other boats competing. 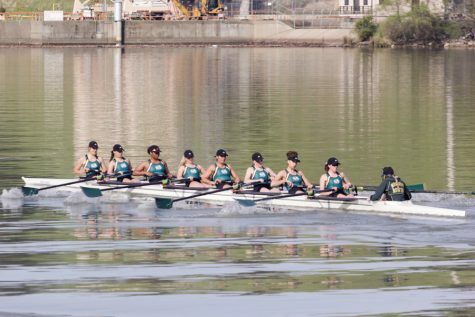 The Sacramento State rowing team finished with a clean sweep in its varsity races against six college programs on Saturday morning at Lake Natoma. 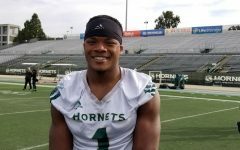 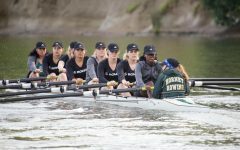 The Hornets — which hosted their annual Sacramento State Invitational for the first race of the season — competed against Humboldt State, Saint Mary’s College, University of Portland, Orange Coast College, Mills College and UC San Diego after a long offseason of practicing. 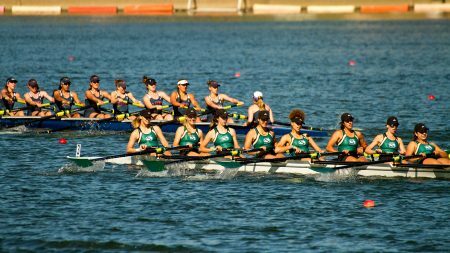 The first-seed varsity eight team led the competition with a big win, finishing significantly ahead of all the other boats. 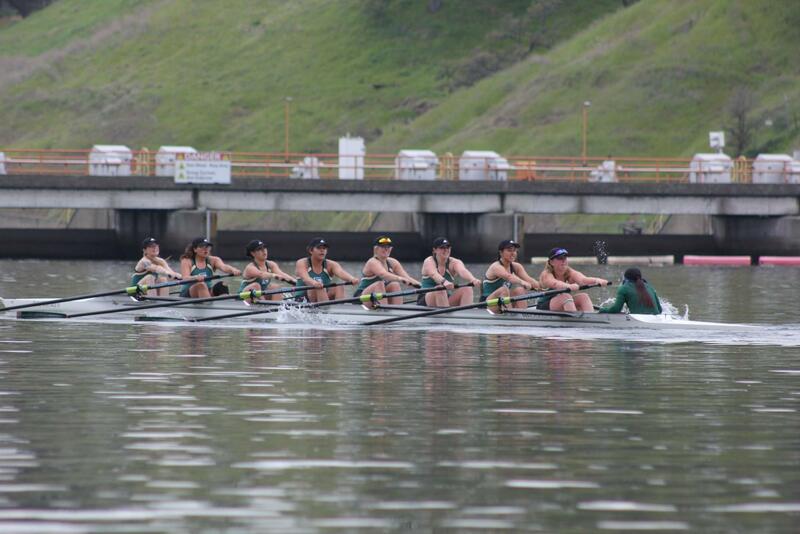 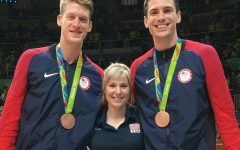 Sophomore Kristin Weinman said it was a team effort from start to finish. 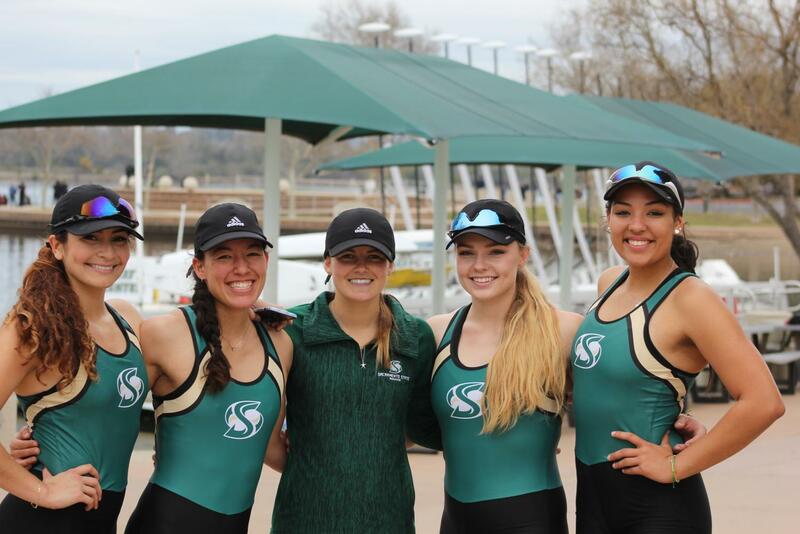 From left to right, sophomore Susana Contreras, junior Alexis Aiello, freshman coxswain Anneliese Solberg, junior Abigail Morgan, and junior Amber Anderson-Wells smile after taking first place in varsity four race at the Sacramento State Invitational at Lake Natoma on Sat., March 10, 2018. 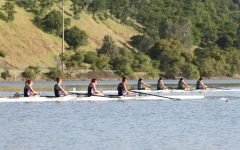 All varsity boats finished in first place with novice taking one first place and one second-place finish. The other two varsity races finished in first place as well. 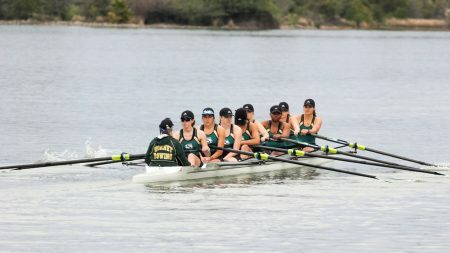 The varsity four team had a closer race with Humboldt State finishing right behind in second and UC San Diego in third. 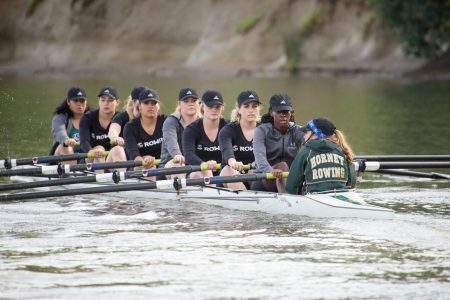 The novice eight team took after the varsity team by finishing first in its race as well, while the novice four team took second. 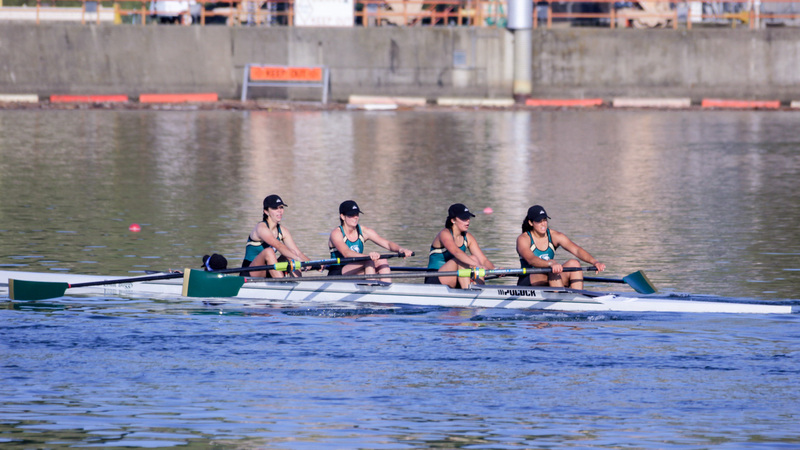 Even after a race like this, senior captain Elena Galvez said she sees some improvements that can be made but thinks the energy of the team will propel it forward in the coming weeks of competition. 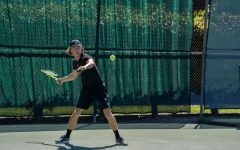 “I’m really excited to see how the rest of the races go, especially because this race is a good race to build off from,” Galvez said. 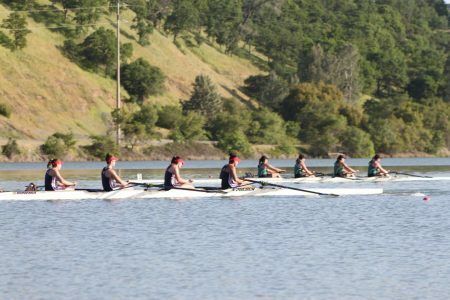 Next weekend, the Hornets will return to Lake Natoma for the Hornet Invitational and compete against San Diego State, which posed itself as a worthy competitor in last year’s invitational. 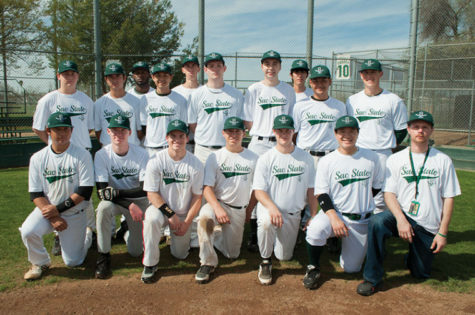 Sac State will also be competing against Saint Mary’s College and Kansas State on Saturday.